With his IRFU contract coming to an end, the Munster man has reportedly been offered an astonishing figure to ply his trade in the Top14. 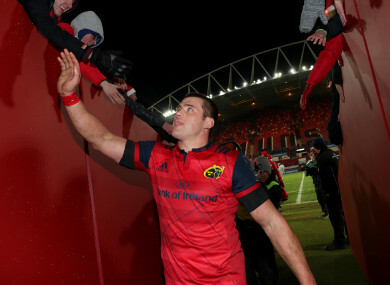 CJ Stander: news of big money offer lands. TOP 14 SIDE Montpellier have reportedly offered CJ Stander €840,000 a year to swap Munster for life in France. The news was first reported by Simon Lewis of the Irish Examiner this morning. Ireland back row Stander’s IRFU contract expires at the end of the season, and he has been on the club’s radar for quite some time. Negotiations on a contract extension are ongoing between Stander and the IRFU though and the Union remain confident they will be in a position to announce a new deal this week. The Examiner are reporting that well-placed sources indicate the 27-year-old South African-born player will be offered a basic salary in the region of €400,000 per year, plus incentives, by the Union. Standing at over double that amount, the astonishing €840,000-a-year — €70,000 per month — offer from Montpellier will surely complicate matters despite Stander’s wishes to stay in Ireland to further his international career. On Friday, fellow Munster man Peter O’Mahony ended speculation over his future by agreeing a new three-year central contract with the IRFU ahead of the 2019 World Cup. Email “Montpellier pull out the big bucks for CJ Stander with huge €840k-a-year offer”. Feedback on “Montpellier pull out the big bucks for CJ Stander with huge €840k-a-year offer”.